The original Cold Hot Plate Test available with ramping temperature from -10 deg. C to 70 deg. C.
IITC Life Science developed the first commercially available Cold Hot Plate test appratus in the world which is capable of truly assessing pharmacological modulation of thermonociception. Used on latency and threshold based nociception for both conventional and non conventional analgesics a safe and humane way of testing. 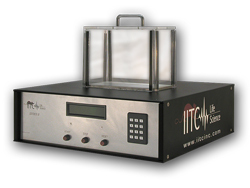 IITC’s Hot Cold Plate is used to measure the nociceptive threshold of analgesic compounds in mice and rats. Conventional constant temperature hot plate tests only measure latencies of stronger narcotic agents. IITC's Hot/Cold Plate Analgesia Meter widens the range of analgesia research to new levels. The unit is microprocessor controlled and can be used for both incremental heating and cooling from any starting temperature from 0 deg. c. to 70 deg. c in 0.1 degrees c. increments. The microprocessor monitors and controls the rate of heating/cooling which can be set from 1 to 10 deg c. per minute. The front panel display shows all test results including length of test in .01 sec. increments, starting temperature and stopping temperature. The plate is uniformly heated/cooled at an adjustable rate and has automatic upper/lower cut-off limits. All parameters are entered via front panel keypad. i.e. rate of temperature increase/decrease, maximum/minimum temperature, date/time and animal number. The IITC system can also double as a constant temperature hot plate analgesia meter. Temperature stability is .1 deg. c.
Upon reaction of either the hind or forepaw (whichever is chosen) the heating/cooling of the unit is reversed to the standby temperature within minutes. The data includes the date, animal number, temperature and time of day. The readout updates the controlled parameters.